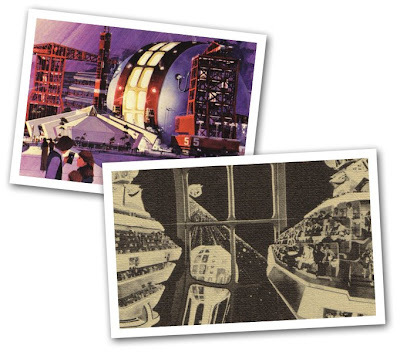 Long before Gary Sinise led trainees into a journey at the International Space Training Center, the Imagineers had devised a different journey into space. Rather than boarding X-2 Deep Space Shuttles, guests would enter a twelve-story high gantry and board the Leviathon. This ship would blast off from Future World, zoom around the earth, then head out into deep space. The attraction would create "the feeling of actually leaving EPCOT and flying through deepest space, complete with the sensation of zero gravity." It took an engineering feat to bring zero-gravity to Epcot guests in 2003. We can only imagine how Disney designers would have pulled this off with a 768-seat theater, rather than a forty-seat centrifuge. I love these pieces, especially the artwork! Keep 'em coming Craig!